Track Shack - IOA Corporate 5k 2018 - They Ran, They Walked, They Gave! 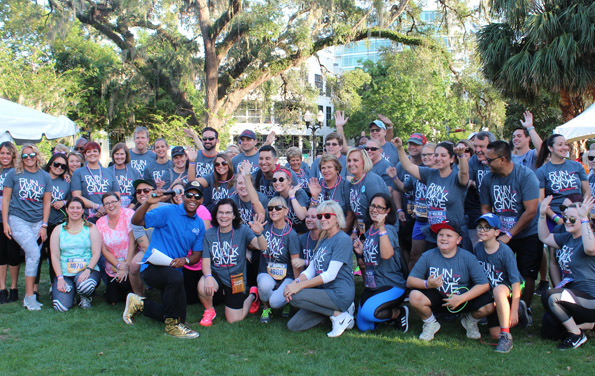 It was a beautiful night in downtown Orlando and runners and walkers from nine states and 13 countries gathered in the spirit of corporate camaraderie, celebrating workplace wellness and helping win the race against food insecurity here in Central Florida. The 24th IOA Corporate 5k attracted 16,833 participants on 687 company teams. Each company has team captains, wellness leaders and HR departments working year round promoting a culture of workplace wellness and promoting the benefits of living healthy. TupperFit, the employee health and fitness initiative of Tupperware Corporation is celebrating 10 years of their wellness program and had a conference that coincided with the race on April 12. They had 23 associates join their team from places such as South Africa, Italy, Brazil, Indonesia, Argentina, Germany, India, France, China, Korea, Mexico, Philippines and Switzerland. Nathan Adams, Manager at Track Shack sprinted to victory, running 16:19 to lead all the runners. Overall female champion Anja Drew, who ran with Cole, Scott & Kissane, P.A. and is a Team Track Shack member ran 18:02 and (literally) soared to her first IOA Corporate 5k win! Melissa Corp, with My Soxy Feet raced to her second consecutive overall female CEO title with a time of 23:20. Daniel Whitehouse of Whitehouse & Cooper, PLLC outran 83 CEOs with a time of 20:12 for his first-ever win. The IOA corporate 5K is not only a networking and team building event it is often the first exposure for many participating in a foot race. This year, 7681 first time participants took to the streets of this walker-friendly race on what may be a transformative experience. Participating individuals and companies joined the race to end hunger and together contributed 101,916 meals (and counting) to Second Harvest Food Bank and the Christian Service Center Love Pantry. “For 24 years we at Track Shack have created Central Florida’s largest office party. It gives our staff great satisfaction watching downtown become an evening of fitness and fun,“ Betsy Hughes, co-owner of Track Shack. 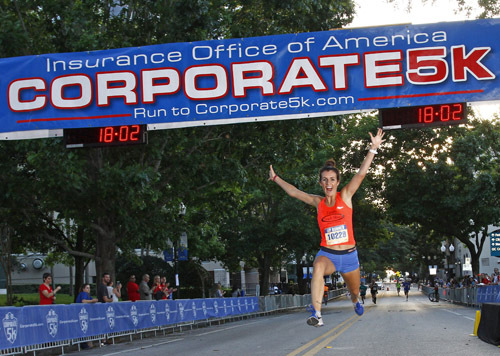 It’s never too soon to start planning for the 25th IOA Corporate 5k! Save the date for Thursday, April 18, 2019.